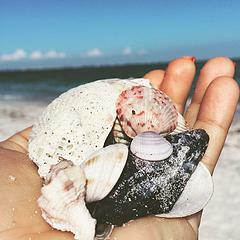 Marco Island, Florida | Wanna Fork Around? Florida Resident Getaway: Marco Island, Naples and Sanibel Island. During the first day we were searching for a good brunch place on the water, since we were on the coast. Well, that didn’t happen. It was actually impossible to find. We ended up at this humble little cafe called ” EJ’s.” We had a great view of a parking lot (haha). The food was alright, nothing special and nothing to complain about. We then headed over to Sanibel Island to check out the scene. We were greeted by cute little beach shops and wide roads lined with palm trees. The island is full of sea shells which is great for shell collecting. The water wasn’t as beautiful ad I had hoped, but was refreshing and felt nice to cool off in. When we stopped at the little grocery store we needed an umbrella and some snacks. 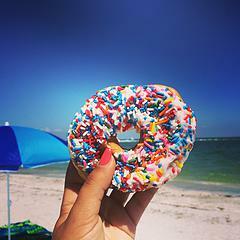 donut, which I took a photo of with a sail boat in the hole. It’s cool, right? Ha! The store is called “Jerry’s” and they make the donuts right there in the store. Also, they make some pretty delicious cold cut subs in case you’re looking for something easy and satisfying while passing through. Outside of the shops, there are cages filled with beautiful and colorful exotic birds who whistle at you. After Sanibel Island, we made our way back to North Naples in about 45 mins while driving down the coast. We drove through Fort Meyers Beach and Bonita Springs. Fort Meyers Beach looked like it had some really cool stores and places to eat. Very small, so don’t blink, you might miss it. Our friends had made dinner reservations at one of the best restaurants in Naples downtown called “Sea Salt.” Yes, the same place that sued the restaurant in Miami for stealing their name, now known as “SeaSpice.” (A little foodie gossip for ya!) Our friend knew everyone there and we were treated with the best service. We had an amazing table outside on the patio while live music played inside. Out of all the wonderful things we tried on the menu, the braised veal cuddled inside of a home made ravioli in a white truffle cream sauce was my favorite entree. I could of drank the sauce if it was socially acceptable to lift the plate and let it drop into my mouth. Yes, it was THAT good. For an appetizer, I would order the fried calamari again for sure. They make all their pasta fresh every morning. The branzino I ordered was perfectly presented and flavor was delicious. 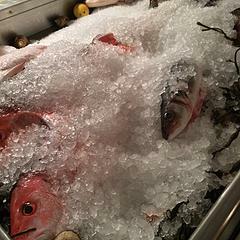 As I walked to the ladies room, I noticed the area where the fish are chilled until someone orders it. Right next to an exposed kitchen with a cozy and soft lit ambiance. We enjoyed a perfectly chilled bottle of white wine called “Anthilia.” The bottle doesn’t look that great but the taste is perfect if you like something close to Sauvignon Blanc. We decided to keep the party going, I mean it is Saturday night at 10:30 PM at this point and we are not 80 years old yet. We decided to check out the new “hot spot” in Naples that stays open until 2 am. Which is late for Naples, incase you aren’t aware. 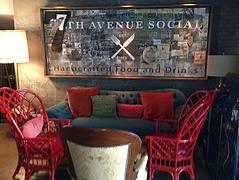 The 7th St. Social bar had live music playing, tables located inside and outside. It’s vibe is very rustic chic with a locals feel. The age range was diverse. We saw older women getting down on the dance floor with young men and groups of women shaking their tail feathers like nobody was watching. After another bottle of white wine, we decided to venture over towards Blue Martini but didn’t go inside. We ended up at some Irish pub to have one more drink and called it a night. It’s our last day on the West coast of Florida and we decided we wanted to go to Marco Island. But first, we need to eat, of course. So, we make our way over to Doreen’s Cup Of Joe. It is SO cute inside. It’s like the perfect decor for a tea party. It was Mother’s Day so they had some extra tables outside for us to sit at since it was pretty crowded. 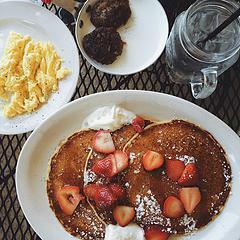 We ordered Huevos Rancheros and savory lemon ricotta pancakes. All their ingredients are from local farms, which was a plus. The service was pleasant and the food was tasty. We asked our server where we should go and she had suggested we go to “Tigertrail Beach.” Which was only about a mile and a half from where we were. So, we headed over to Marco Island to be pleasantly surprised by beautiful blue waters and almost all white sandy beach. It was pretty empty and that was a good thing. We had the beach to ourselves, except for a few oldies taking their daily beach naps. The water was perfect temperature to cool off and to float around in. I would definitely go back to Marco Island before I went to Sanibel Island. That’s just my personal preference though. I like aqua green and bright blue waters when I am at the beach. Marco Island reminded me a lot of Miami mixed with the Keys.